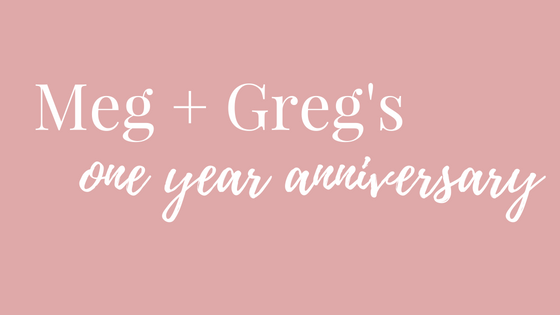 We can’t believe it’s already been a year since Meg and Greg tied the knot! These laid-back lovebirds gave us their wedding planning tips for the perfect day. From table runners to string lights, Meg’s vision of a woodsy wonderland still has us dreaming of elegance and romance. In honor of their one-year anniversary, we touched based with Megan as she reflected on her big day. We love her attitude and tips for making a happy and stress-free wedding day. P.S. : If you’re looking for some elegant photo inspiration, check out a few of their wedding pictures- Meg just radiates beauty, doesn’t she? 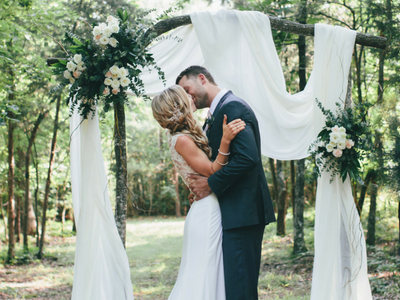 A 4 Tiered Naked Cake, First Kisses Under A Picture Perfect Arbor and an 18-ft Eucalyptus table swag. These are what wedding fairytales are made of! Describe your wedding style for us! Simple and natural, but still with a touch of elegance. I wanted to capture the beauty of the outdoors without glamming it up too much! Did you have a vision that you wanted to go for as soon as you got engaged or did it take you seeing your venue to really know what feel you wanted? I was never the girl who grew up with a picture of my wedding in my head, so planning and making the big decisions were definitely tough for me! My husband and I had two different visions. If it were up to me, I would have had a private, backyard wedding with immediate family and best friends. He wanted a big celebration. We compromised on an 80 person wedding in a stunning country venue, which I think captured the simple, yet elegant look and feel that I was hoping for. I wanted woods with lots of greenery and romantic string lights, so when I saw our venue for the first time, I knew it was the place for us! Seeing it in person definitely helped me to envision our day! Speaking of venues, yours was beautiful! What made you choose this one in particular? We actually found our venue one night when we were searching on Wedding Wire together. We wanted something that was close to where we lived in Charlotte, but to get the outdoor vibe that we wanted, we had to be willing to go outside the city a bit. When we stumbled upon Carolina Country Weddings and Events, the pictures drew us in immediately. Rolling hills, a wedding ceremony site in the Carolina woods and dreamy string lights draped perfectly over an open dance floor – we were sold (even if it was a little inconvenient being an hour outside the city). Turns out we loved the photos on their website so much, we asked the owner of the venue who their photographer was and we hired her for our wedding! During your planning process, did you have any eye-opening experiences that totally took you by surprise? IE. things that you weren’t expecting from a cost standpoint or situations that you didn’t even know you would have to think about? Having a venue in the country comes with challenges – no hotels or restaurants within a 30-minute drive was a bigger challenge than we thought. We also had to add in shuttle transportation to and from the hotels because we wanted our guests to have fun and be safe, of course! It was worth it in the end, but it was definitely a not-so-fun speed bump along the way during the planning process. Is there any detail that you would change or any situations that you would handle differently? I was so worried about two things before the wedding after letting a few outside opinions get in my head – table runners and decor to line the entrance to the aisle for the ceremony. Two of which we ended up leaving out completely on the day of and it was absolutely perfect. Those two things caused me so much silly stress in the last two weeks leading up to the big day! Hindsight is always 20/20, but I wish I had let those go and realized how not important they were long before the wedding day! I wanted to get married in nature because of the natural beauty – if you have a venue that is naturally lush and pretty all on its own – less is more! Don’t stress yourself out. What is the one big moment on your wedding day that stands out in your memory? It’s too hard to pick just one!! There are a lot, and they all revolve around special family moments. There was a moment on the dance floor where my husband was dancing with his sister and I was dancing with my big brother at the same time. I just remember feeling so much joy in that moment! Also, my husband’s family is Lithuanian and it’s tradition to have a toast from one of the family members with a Lithuanian shot – it was at that moment that I felt like I was really a new member of the family! What was your favorite planning advice that you received while you were planning? Is there any wisdom that you would pass on to future brides? If you’re indecisive during the planning process it’s probably because you either haven’t established what it is that’s truly important to you and your future husband or you have, but you’re letting other’s opinions creep in and make you doubt your decisions. It’s great to have help and ideas from family and friends (and of course they all mean well!) but it’s easy to let this lead to doubt, indecision or overspending which you may ultimately regret. Know what’s important to you and your husband, stay true to yourself and remember it’s about the celebration of your marriage, not just a wedding day!! Those teeny tiny details are things no one will ever remember. From the beautiful bridesmaids’ bouquets to the elegant invitations suite and the show-stopping head tablescape, the simple details of this wedding came together to create the perfect woodland fairytale. We love all of these wedding planning tips and advice. We definitely see that prioritizing can make all the difference in the world! Meg and Greg understand the value of heartfelt moments, simple treasures, and never-ending love. We are so happy for these two and wish them many more anniversaries to come!